Packaging is important in any industry, but focus too much on it -- either as a producer or consumer -- and you risk not paying enough attention to the contents. Truett-Hurst winery this month introduced a fantastic new paper wine bottle, sold only at Safeway grocery stores. It's beautiful, eye-catching, responsible, revolutionary. I love it. I wish I loved the wine in it. But first things first. Produced by Green Bottle, the bottle is made from 80% used corrugated cardboard, mostly recycled from industrial uses. It's 85% lighter than a glass bottle, so it requires less fuel to ship. The company claims one cross-country truck of Paperboy wine saves 61 gallons of diesel fuel, meaning a lot less CO2 in the atmosphere. I love the brand name Paperboy, the logo, even the color scheme, all industrial beige with black logo except for a splashy diamond, red or teal, that announces the type of wine. The bottle is lined with the same sort of plastic bladder as bag-in-box wines, which is great for a while. I don't know how long it will protect the wine from oxidation on the shelf. Bag-in-box wines are generally good for a little less than a year, which can present a problem if they spend too long getting to consumers; this limits the utility of foreign bag-in-box wines, because you don't know how long they spent on a ship, clearing customs, and sitting in a warehouse. The fact that Paperboy is going only to Safeway should alleviate this problem; a grocery store should know how to deal with shelf life. I'd love to see a sell-by date right on the paper bottle. I've never seen such a bold statement from any winery. But most wines in the supermarket category aren't meant to be put in your cellar; Treasury Wine Estates recently had to pour $33 million worth of expired wine down the drain. For a wine like this that's all about the packaging, why not emphasize that it's fresh produce? Especially since this wine seems targeted at the green consumer, that would seem to be worth trying. Speaking of the green consumer, I wonder how one of these wines would do without sulfites? Look at the way no-sulfite wines* are marketed at Whole Foods. They push the green angle; they clearly think there's an overlap of niche markets. I'm not aware of any no-sulfite wines in an environmentally friendly bag-in-box package, and this is the perfect opportunity. Moreover, if the producer put a sell-by date right on the package, that would alleviate the greatest fear of no-sulfite wines, that they oxidize and turn weird after too long on the shelf. * You are not allergic to sulfites. What I'd also love is for Truett-Hurst to pay a little more attention to the wine in the bottle. Basically, these are bag-in-box wines, except they're served in a bottle-shaped cylinder. When you consider the quality of wine you can get in a 3-liter square box for $20, paying $14 for 1/4 of the amount of wine isn't such good value. Paperboy Paso Robles Red Blend 2012 ($15) is OK; it tastes like a supermarket red blend, juicy and fruity and without a lot of complexity. It's definitely the more successful of the two wines. If you buy this bottle as a curiosity to serve at Thanksgiving, it will not disappoint, especially the non-enophile drinkers. Go ahead, buy it, reward the innovation. But there are a thousand wines like this and $15 for a bottle is steep. What I hope is that having a solid but overpriced red wine and a poorly made white wine in this innovative package doesn't doom the package itself. Americans are down on the concept of box wine because they expect it to taste cheap, which it doesn't have to, but that quickly becomes a self-fulfilling prophecy. 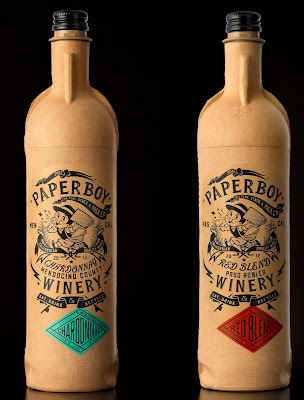 Wouldn't it be great if the paper bottle came to mean environmental responsibility and great-tasting wine? It's halfway there. I loved the package idea too. Unfortunately the wine is not available here as I'd love to try it. I do agree though, if we are to convince consumers about the value of alternative packaging, the wineries must be FULLY committed and put decent wine in these new packages to reward the innovative consumers. I've done a fair amount of research in the bag in box and other alternative packaging areas. All of the plastic alternatives to glass leak oxygen at a far greater rate than is acceptable for decent much less fine wine. If you get it set up perfectly which is always a challenge the wine has a bottling to consumer shelf life of 6-9 months. You need an amazing distribution and sales organization to move product through in that time line. This packaging is also much more susceptible to heat damage. As SO2 is the main heat and oxidation protectant in wine this type of packaging would be a terrible choice for a no SO2 or even low SO2 approach. Thanks Larry, that's worth knowing. That said, if a winery was ever going to try a no-sulfite version, this would seem to be the perfect opportunity: one buyer, a single grocery store chain that presumably owns refrigerated trucks. I'm not asking for fine wine in a box. But with all the decent wine available in California today, is that really too much to ask? You may force me to rethink my evaluation of the red blend: maybe "good enough" is more special than I thought. Larry, on that point, have you done any research in the "life span" of a wine bottled specifically for sale through mass outlets like supermarkets (esp. in the UK)? Through an earlier blog entry comments section, The Long Tail concept has been introduced to your readers. Forgive the pun, but this seems like the tail wagging the dog. A paper bottle wine is a real "outlier." The novelty packaging is the star attraction here, not the contents based on your indifferent reviews. An example of "All sizzle, no steak”? This wine might elicit a single bottle purchase from intrigued consumers . . . but no repeat business if the wine is unappealing. I agree with Larry: the stock-turn rate of this product will be a challenge to the three-tier distribution system. More people should experiment with alternative packaging. There's too much myth around the bottle and cork business. Badger Mountain Vineyards, WA has been producing a NSA (I know there could be a significant amount of SO2 in there) red and white blend in a 3L box for at least 2 vintages. Their website states that they produce 10K cases of red, less of the white. They sell through Safeway . . . probably only in WA. Anyone in OR see this locally?